If you have built your website with a text editor or program such as Dreamweaver, you will need to use an FTP client to upload your website from your computer to your cPanel hosting account. Note: Your cPanel hosting account must be set up before you can upload files to it. Make note of the IP address and cPanel username shown on the hosting plan details page. 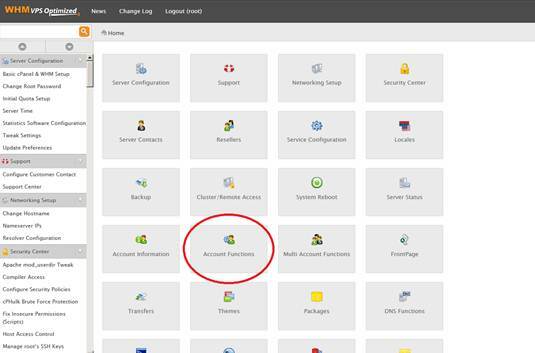 If you do not know what your cPanel password is, you can also change it from this page. We recommend FileZilla for FTP, but you can also use the FTP settings that you located previously for other FTP clients and sitebuilders. The instructions below reflect connecting via FTP with Filezilla. Download, install, and launch FileZilla. At the top of your Filezilla window, you will see a Quickconnect bar. In the Remote Site area on the right hand side of Filezilla, open your website’s root directory. In the Local Site area on the left hand size of Filezilla, open the folder containing your website. This folder should contain your website’s index file – like index.html or index.php. To upload your website, select all of your website’s files and directories, and then drag them from the Local Site area into the Remote Site area. Note: How long it takes to upload your website depends on its size and your internet connection. Now that your files are uploaded, you can go to your domain name and see your website! Warning: These instructions do not apply to Plesk shared hosting accounts. 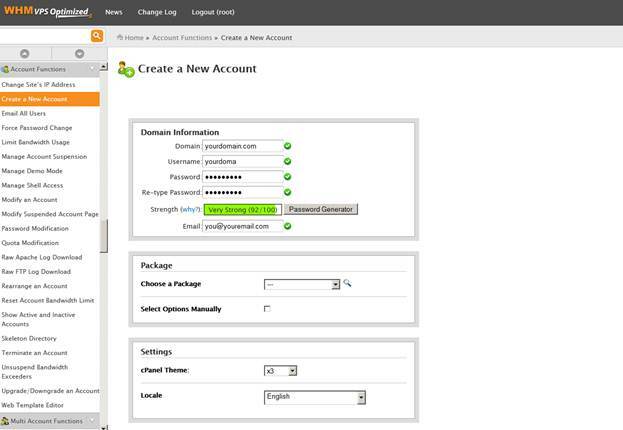 If you’re using a Plesk shared hosting account and want to create email, see Set up email addresses. Note: Your Mailbox’s size counts toward your account’s Disk Space Usage. After creating email accounts, you can either check them with webmail(requires DNS changes) or use an email client. If your Plesk email accounts aren’t working, you probably need to update your domain name’s email settings (technically known as its DNS zone file’s MX Records) — we’ve got that information for you in Configuring DNS for Your Plesk Domain. Plesk lets you add new domains to your hosting account so you can host multiple websites. Note: This feature is not available to Economy Plesk shared hosting accounts (more info). If you don’t want to add a new domain name with its own website, you can also add domain aliases (more info) and subdomains (more info). Domain name Enter the domain name you want to use. DNS Settings Select the DNS option you want to use for the domain name. Hosting type Select the type of hosting you want to create. If you want to host a website for this domain, select Website hosting. Hosting settings Enter the directory you want to use as the new site’s root directory, i.e. the directory that displays when visitors go to the domain name. Unless you’re using shared hosting in the same account as your domain name, you’ll need to point your domain name to its new hosting account (more info). Note: Your Mailbox Quota counts toward your account’s Disk Space Usage. After creating email accounts, you can either check them with webmailor use an email client. If you have trouble adding a cPanel email account to Outlook.com email, check out Outlook.com Postmaster for assistance. If your cPanel email accounts aren’t working, you probably need to update your domain name‘s email settings (technically known as its DNS zone file’s MX Records) — we’ve got that information for you in Configuring DNS for your cPanel domain. If you want to host a domain name‘s website on your server using cPanel®, you have to create an Account in WebHost Manager (WHM). Log in to WebHost Manager using root for your username and your server’s password at https://yourserverip:2087, where yourserverip is your server’s IP address. In the Home section, click Account Functions. Complete the on-screen fields in the Domain Information section. Note: WHM automatically creates a Username for you based on the first eight characters of your domain name. (Optional) Complete the other on-screen fields. WebHost Manager displays a results page outlining your new Account. 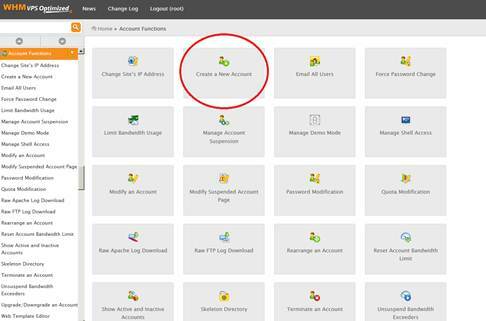 If there are no problems, WebHost Manager displays Account Creation Complete!!! at the bottom of the page. If you forgot your server’s password, you can reset it. Enter and confirm the password you want to use, and then click Save. Your server comes with a dedicated IP address you can use for access. Here’s how to find that IP address.